Hypercholesterolemic subjects have increased oxidant stress and dysfunction of the vascular endothelium. In this double-blind placebo-controlled crossover study we tested whether short-term treatment with the antioxidant and dietary supplement α-lipoic acid could reverse systemic oxidant stress and endothelial dysfunction in 7 subjects with hypercholesterolemia. 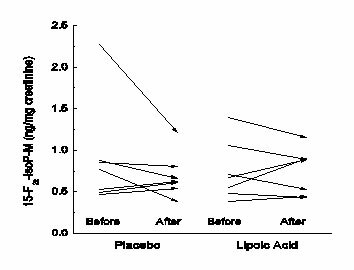 Subjects were administered either placebo or 300 mg of α-lipoic acid twice daily for 4 weeks. After a 6-week washout period, they crossed over to the other study drug for another 4 weeks. At each of four visits before and after the two treatments, lipid profiles and markers of oxidant stress were assessed along with nitric oxide-dependent and -independent vascular relaxation, as measured by pulse wave analysis using applanation tonometry of the radial artery. Except for hypercholesterolemia (low-density lipoprotein, LDL = 179 ± 21 mg/dl), the subjects were healthy without overt cardiovascular disease. However, they did have elevated urinary concentrations of 2,2-dinor-5,6-dihydro-15-F2t-isoprostane, a measure of systemic oxidant stress. The augmentation index, a measure of arterial stiffness derived from pulse wave analysis, correlated with the LDL cholesterol concentration. Nitric oxide-dependent vascular reactivity following albuterol inhalation, measured by the decrease in augmentation index, was impaired in these subjects, but nitric oxide-independent reactivity was preserved, reflected by the expected decrease in augmentation index following sublingual nitroglycerin. These results showed that the subjects were under increased oxidant stress and had endothelial dysfunction. However, 4 weeks of α-lipoic acid treatment failed to reverse either defect. Atherosclerosis, at least in its early stages, is an inflammatory disease that is frequently initiated by inappropriately high concentrations of low-density lipoprotein (LDL). LDL can slowly build up in the walls of arteries feeding the heart and brain, and forms plaque leading to cerebrovascular disease, cardiovascular disease, and atherosclerosis [1-3]. With its ingestion by macrophages and other inflammatory cells, LDL causes activation of oxidant stress pathways and itself can become oxidized in the sub-endothelial space and thus contribute to endothelial dysfunction, one of the earliest manifestations of atherosclerosis. In particular, oxidized LDL impairs nitric oxide-dependent vasodilation by reducing both its synthesis and biological activity. Antioxidants, including vitamins C and E, are effective in reducing oxidant stress-induced lipid peroxidation in cell cultures and even in humans. However, clinical trials of these vitamins as treatments for established atherosclerosis have been largely disappointing. It is possible that other antioxidants might have more beneficial effects. For example, α-LipoicAcid (LA), an antioxidant and dietary supplement, has been used for over four decades to treat a variety of conditions linked to “oxidant stress.” Persons with poorly controlled diabetes have low concentrations of plasma antioxidants and increased plasma concentrations of lipid peroxides . The latter include thiobarbituric acid-reactive substances, lipid hydroperoxides, and F2-isoprostanes [5-8]. Treatment of persons with diabetes with 600 mg/day of lipoic acid for more than 3 months significantly decreased plasma lipid hydroperoxides, an effect that was independent of glycemic control . Even in healthy persons without diabetes, taking 600 mg/day of lipoic acid for 2 months decreased both urinary F2-isoprostanes and the susceptibility of plasma and LDL to ex vivo oxidation . Previous studies have shown that hypercholesterolemia induces both oxidant stress and endothelial dysfunction, the latter as manifest by impaired nitric oxide-dependent vascular reactivity [10-13]. The results of the trial by Marangon et al. suggest that LA might be of benefit in reducing oxidant stress and endothelial dysfunction due to high levels of LDL . Accordingly, we conducted a double blind, placebo-controlled crossover trial of short-term LA treatment in subjects with hypercholesterolemia. The study group consisted of 7 hypercholesterolemic subjects (5 women and 2 men) aged 50-75 years with elevated LDL cholesterol (160-190 mg/dl), but no overt atherosclerotic vascular disease. Other exclusion criteria for the study were diabetes mellitus, smoking in the previous 6 months, presence of 2 or more cardiovascular risk factors in addition to hypercholesterolemia, vitamin or antioxidant supplementation, hypertension, lipid-lowering medications, or abnormalities in hepatic or renal function tests. Subjects gave written informed consent, and the Institutional Review Board of Vanderbilt University approved the study. This was a double-blind placebo-controlled cross-over trial in which the subjects were randomly assigned to take placebo or 300 mg of racemic LA twice daily for 4 weeks, followed by a 6 week wash-out period, and then by a 4 week period on placebo or study drug not taken during the first period. The Vanderbilt Investigational Pharmacy prepared LA and placebo in identical capsules and kept the medication study codes until completion of the study. Subject compliance with medication was monitored at each visit by pill counts. Subjects followed their regular diets and exercise during the study. After initial screening, subjects were evaluated during 4 fasting visits to the Vanderbilt Clinical Research Center, before and after each study period. At each of the 4 visits, blood was taken by venipuncture and collected in ethylenediaminetetraacetic acid (EDTA) containing tubes. Plasma was separated from erythrocytes by low-speed centrifugation and stored in separate aliquots at -70° C until assay. The Vanderbilt Clinical Laboratory measured plasma metabolic and lipid profiles, and C-reactive protein. Plasma vitamin C and α-tocopherol concentrations were measured by high-performance liquid chromatography (HPLC) using electrochemical detection as previously described for guinea pig plasma . Plasma α-tocopherol concentrations were normalized to the plasma LDL concentration in the same sample . Urine was obtained at each of the 4 visits, frozen at -70° C, and assayed in one batch for the major urinary metabolite of 15-F2t-isoprostane, termed 2,2-dinor-5,6-dihydro-15-F2t-isoprostane (15-F2t-IsoP-M). This assay used stable isotope dilution mass spectrometry to quantify 15-F2t-IsoP-M in the urine and was carried out as previously described. The isoprostanes are a group of prostaglandin-like compounds generated from the non-enzymatic free-radical-catalyzed peroxidation of arachidonic acid . Concentrations of 15-F2t-IsoP-M in urine have been shown to be strongly affected by conditions associated with increased oxidant stress in vivo in humans, including hypercholesterolemia . Urinary 15-F2t-IsoP-M concentrations were normalized to urinary creatinine concentrations . Vascular reactivity was assessed at each of the 4 visits in each subject by pulse wave analysis of the radial artery in response to albuterol or nitroglycerin challenge. Pulse wave analysis of the distal radial artery was assessed using a Millar Tonometer (SPT-301B) with data accumulation of 13 cardiac cycles. From the averaged composite radial waveform an aortic pressure waveform was derived using a validated transfer function algorithm using SphygmoCorPx Version 6.1 software (AtCor Medical, Sydney, Australia) . The augmentation index (AIx), which is a measure of arterial stiffness, was calculated as the difference between the first and second systolic peaks of the central pressure waveform expressed as a percentage of the pulse pressure. The validity of this method has been established prospectively . After obtaining baseline data on the resting and recumbent subject for 10 min, nitric oxide-dependent changes in the AIx were determined at 10-15 min following inhalation of albuterol (200 mg) with a spacer device. This was followed in 30 min by assessment of nitric oxide-independent vascular dilation by sublingual nitroglycerin spray (2 sprays of 0.4 mg each) and measurement of arterial pressure pulse waves at 10-15 min. This approach to assessing nitric oxide-dependent and independent vascular dilation has been previously validated in normal and in hypercholesterolemic subjects, since the reduction of Aix after beta2-adrenergic receptor stimulation was blunted by intravenous administration of N-ϖ-nitro-monomethyl-L- arginine, a specific inhibitor of nitric oxide synthase [20-22]. On the other hand, vascular dilation due to nitroglycerin was unaffected by N-w-nitro-monomethyl-L- arginine [20-22]. The results were calculated as mean ± standard deviation. Statistical significance was determined by paired t-testing or the signed-rank test (when data were not normally distributed) using the software program SigmaStat 2.0 (Jandel Scientific, San Rafael, CA). All analyses were two-tailed, and significance was based on a p value of <0.05. There were 5 women and 2 men recruited to the study, whose mean age was 57 ± 5 years, and whose Body Mass Index (BMI) ranged from 25 to 31 kg/m2, with a mean of 27 ± 2 kg/m2. Table 1 shows the blood pressure and clinical laboratory results for the four study visits, averaged over all the subjects. Except for elevated LDL cholesterol of 179 mg/dl, lipid parameters were normal and not affected by lipoic acid. Plasma glucose, ascorbic acid, and α-tocopherol concentrations (even when normalized to the plasma LDL concentration) were normal and also unaffected by lipoic acid. C-Reactive protein was within the reference range (0-10.0 mg/L) in all subjects, and also unaffected by lipoic acid. The isoprostane metabolite 15-F2t-IsoP-M averages at each of the study visits (Table 1, last row) were each significantly increased in these hypercholesterolemic subjects, compared to a mean of 0.46 +/- 0.09 mg/mg creatinine in normal subjects . However, there was no effect of either placebo or LA on urinary 15-F2t-IsoP-M concentrations (Table 1). This is shown for the individual subjects in Figure 1. There was no correlation of the average of the two baseline LDL cholesterol concentrations with the averaged baseline urinary 15-F2t-IsoP-M concentrations (R = 0.12). Figure 1:Changes in urinary 15-F2t-IsoP-M concentrations with treatment. Arrows show initial and final 15-F2t-IsoP-M concentrations before and after placebo and LA treatments for individual study subjects. Nitric oxide-dependent and –independent vascular reactivity determined as the decrease in AIx after albuterol and nitroglycerin is shown in Figure 2. Although the AIx decreased in response to albuterol inhalation in the majority of subjects after both placebo and LA, this did not reach statistical significance for either treatment group. There was no effect of LA treatment on the change in AIx (corrected for heart rate) for each subject following albuterol inhalation (p = 0.58). The AIx response to nitroglycerin decreased in every subject in both treatment groups (Figure 2), although LA did not improve the AIx response to nitroglycerin (p = 0.14). There was no correlation between the average of the two baseline LDL cholesterol concentrations and the AIx corresponding AIx (R = 0.11, p = 0.82). Figure 2:Basal and stimulated changes in AIx for each treatment. Arrows show the effects of placebo (top panel) and LA treatment on responses to inhaled albuterol and sublingual nitroglycerin for each study subject. The results of this short-term crossover study testing effects of LA on oxidant stress as measured by plasma levels of ascorbate and α-tocopherol and of urinary levels of 15-F2t-IsoP-M failed to show a protective effect of LA treatment. The subjects in this study had moderate elevations in LDL cholesterol as their only obvious metabolic abnormality except for mild obesity. It has been demonstrated that therapy with α-lipoic acid on its own or combined with EPA may have beneficial effects in body weight in obese or overweight women on a calorie-restricted diet . Under the current Adult Treatment Panel III guidelines of the National Cholesterol Education Program, the average LDL concentration of these subjects (160-190 mg/dl), taken with their low number of risk factors, would place them in a group not mandated for cholesterol-lowering drug therapy. Nonetheless, as in a previous study of subjects with serum total cholesterol levels of >240 mg/dl or LDL levels of >160 mg/dl, the subjects in this present study had elevated levels of oxidant stress as measured by urinary 15-F2t-IsoP-M concentrations. Of significance is that all these determinations were carried out in the same laboratory. The mean 15-F2t-IsoP-M concentrations in the hypercholesterolemic subjects in the study by Morales et al. was 0.85 ± 0.21 ng/mg creatinine, whereas in the present study the averaged concentration for the two baseline periods was 0.82 ± 0.44 ng/mg creatinine. Both sets of results from hypercholesterolemic subjects were almost twice those of subjects without hypercholesterolemia, and significantly different. Although plasma α-tocopherol concentrations standardized to the plasma LDL cholesterol were in the normal range, plasma ascorbate concentrations were in the lower normal range for unsupplemented subjects [15,24,25]. These results confirm that even mildly to moderately hypercholesterolemic subjects are under significant oxidant stress. Despite the fact that these subjects were used as their own controls in a cross-over manner, 4 weeks of LA supplementation failed to decrease elevated urinary 15-F2t-IsoP-M concentrations. This may relate to the relatively short duration of treatment in the present study (4 weeks). For example, Morales et al. found that supplementation of hypercholesterolemic subjects for 4 months with a combination of high dose antioxidants (8 g daily of vitamin C, 3200 IU daily of vitamin E, and 240 mg daily of β-carotene) normalized urinary 15-F2t-IsoP-M concentrations . Further, Marangon et al. found that treatment of normal volunteers with 600 mg daily of LA for 8 weeks significantly decreased urinary F2-isoprostanes and other markers of oxidant stress . Although rodent studies show that oxidant stress in a model of glucose-feeding-induced insulin resistance and hypertension requires as little as 3 weeks of LA for reversal this may not be the case for humans . In a randomized control trial, LA did not provide any additional benefit to ß-cell function in type 2 diabetic patients undergoing short-term continuous subcutaneous insulin infusion (CSII) as compared to rosiglitazone or metformin which were better than CSII monotherapy . Failure to see an effect of LA treatment on oxidant stress does not necessarily mean that it will not improve endothelial dysfunction. In this study, the latter was assessed using changes in central pulse wave analysis in response to beta2 adrenergic stimulation, which has been established to accurately reflect changes in nitric oxide-mediated vascular dilation [20,22,28]. The subjects in the present study did not have a significant decrease in albuterol-induced AIx, although all showed decreases in AIx following sublingual nitroglycerin. This suggests that the potential for nitric oxide- mediated vascular dilation was present, but that inadequate nitric oxide was generated to cause significant vascular relaxation and a decrease in AIx across the study group, a hallmark of endothelial dysfunction. Further, the decrease in AIx was not enhanced by treatment with LA. It has been previously reported that a single oral 600 mg dose of LA did not affect the AIx in healthy older men . On the other hand, a 4 week treatment of subjects with metabolic syndrome with 300 mg daily LA did increase endothelium-dependent flow-mediated dilation by 44% without an effect on plasma concentrations of 8-isoprostane, although interleukin-6 and plasminogen activator inhibitor-1 (PAI-1) concentrations were decreased . Given the higher dose of LA taken in the present study of the same duration, our results suggest that subjects with hypercholesterolemia and perhaps underlying though clinically silent atherosclerosis do not have improved nitric oxide-dependent vascular responsiveness in response to LA. This work was supported by NIH grant AT001062. Morales CR, Terry ES, Zackert WE, Montine TJ, Morrow JD (2001) Improved assay for the quantification of the major urinary metabolite of the isoprostane 15-F(2t)-Isoprostane (8-iso-PGF(2a)) by a stable isotope dilution mass spectrometric assay. Clin Chim Acta 314: 93-99. ©2015 Sabharwal AK. This is an open-access article distributed under the terms of the Creative Commons Attribution License, which permits unrestricted use, distribution, and reproduction in any medium, provided the original author and source are credited. 715 Preston Research Building, Vanderbilt University School of Medicine, Nashville, TN 372326303, USA, Tel: (615) 9361653; Fax: (615) 9361667.